Galilee is divided into two parts. Lower Galilee is lower in elevation than Upper Galilee. 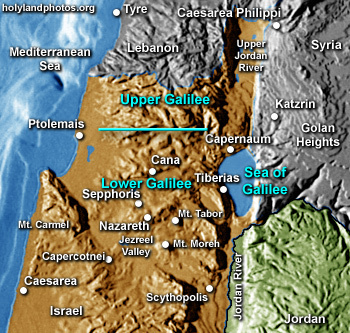 The two parts of Galilee are divided by an imaginary line that runs east from Ptolemais — see the map. The hills of Lower Galilee are all below 2,000 ft. [610 m.]. The area stretches south from this line to that area of Nazareth where the hills descend into the Jezreel Valley. This is a relatively ‘open” area — that is because of low rolling hills and broad valleys — it is open to outside influences as major southwest to northeast and southeast to northwest roads run through this area. In the New Testament (Second Temple) era, first Sepphoris and then Tiberias were the capitals of Galilee. This is the area that Jesus grew up in and was one of the major areas of his public ministry — see Cana of Galilee. For a geographical description of this region see Carl Rasmussen, The Zondervan NIV Atlas of the Bible (Grand Rapids, MI: Zondervan, 1989), pp. 33-35. To view for purchase Click Here.